What is the Venice Beach BID? 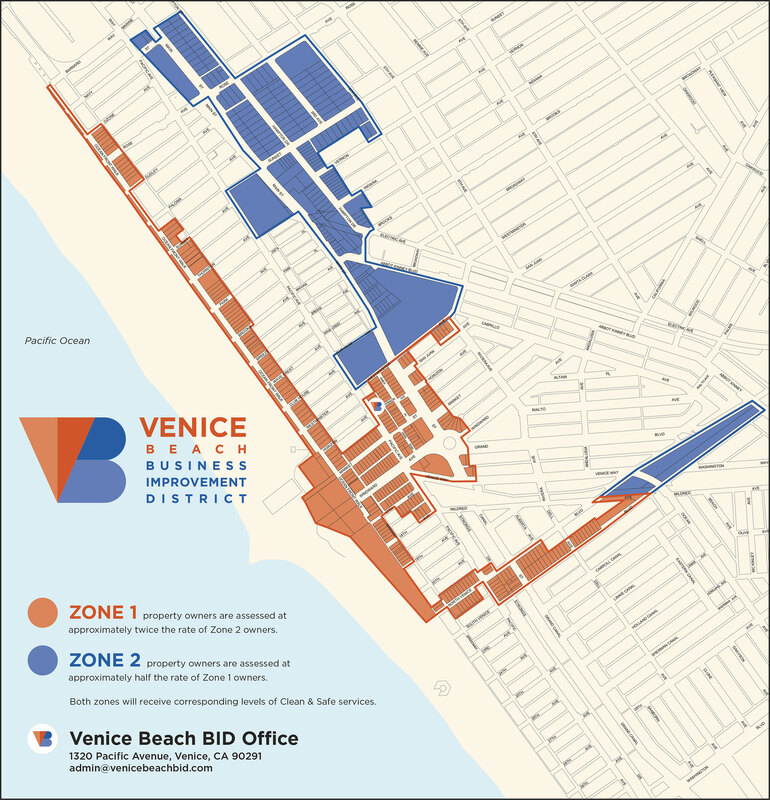 Proposed by a group of concerned local property owners and ratified by the City in 2016, the Venice Beach Business Improvement District (VB BID) serves Venice as a nonprofit organization. Property owners within the boundaries shown below make a collective contribution to fund BID operations. The VB BID’s primary purpose is to provide Clean & Safe services within the BID zones, above and beyond what the City alone can deliver. As shown on the map, the VB BID has established two different zones. Zone 1 property owners are assessed at approximately twice the rate of Zone 2 owners. Both zones will receive corresponding levels of Clean & Safe services. Within the service area, the VB BID Clean Team helps keep sidewalks, streets and alleys free of weeds, debris, trash and graffiti. They work to identify and correct blight in our community. And our trained Safe Team responders provide services ranging from incident prevention to welfare checks to compliance with local laws and ordinances. The Safe Team is also trained to work respectfully alongside other local resources to assist with issues of homelessness. Check Out Our Document Library! In the documents listed adjacent, you’ll find all the details about how this BID was formed, as well as a timeline of activities leading up to our Clean & Safe services launch – so you can see exactly what’s been done since the BID was formed. There are also more general reports on what BIDs are, how they operate, and what people think of them. If you don’t find the information you’re looking for on our website, please contact us.